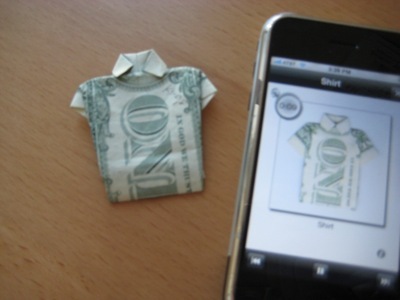 The $US1 iPhone app has 50 different dollar bill origamis to choose from and each has its own step-by-step instructions. The origamis range from animals, clothing, rings, structures, Yoda, and more. There's a few extra features like a self timer for testing your speediness and a sequence builder for creating your own origamis. But I was unable to really utilise this app to its full potential for one simple reason, I'm horrible at making origamis. I started off pretty ambitious and jumped right into the cool looking TIE Fighter. After 15 minutes and many sighs of frustration I gave up. 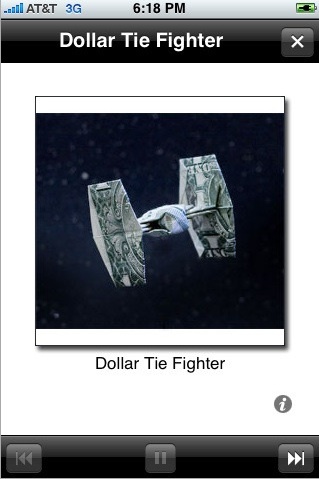 Here's what my Dollar Bill TIE Fighter looks like, yea I know it's pretty pathetic. 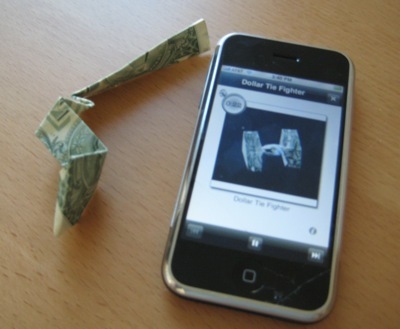 Even though the TIE Fighter killed my dreams of becoming a professional Dollar Origamist I decided to try my luck at folding a T-shirt. Well the sleeves aren't exactly perfect but I guess I did it?